Shhh... baby is sleeping as we tip toe into the Sweet November nursery. Watching over the little bundle of joy are the Forest Nursery Pals. The stuffed squirrel sits high on the shelf with a twinkle in his eye. The stuffed bunny is smiling down at her new little friend. And the stuffed teddy bear is cozy in the crib wrapped in baby's arms. These warm and fuzzy pals know that they have years ahead of them playing and comforting sweet baby as he grows up and they couldn't ask for anything more. 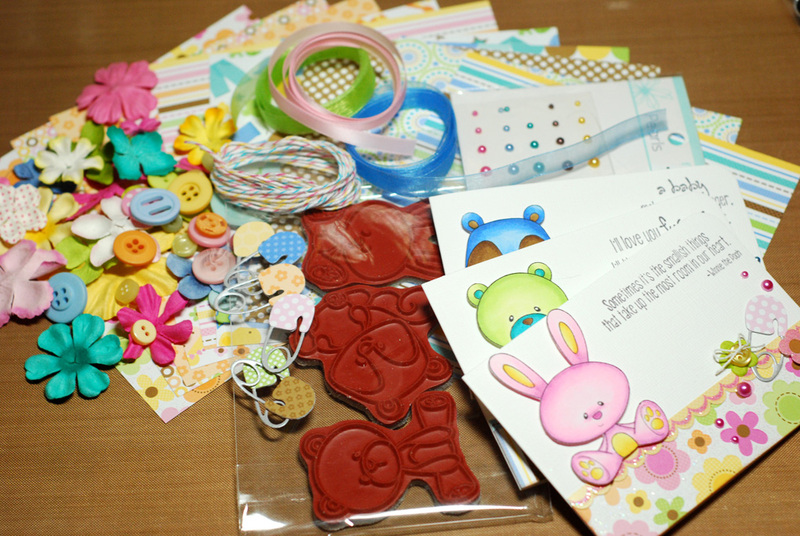 The Forest Nursery Pals candy kit includes; one Sweet November Forest Nursery Pals rubber stamp set, ten 6x6 sheets of Doodlebug paper, Prima flowers and Kaiser Craft pearls, ribbon, twine, buttons, diaper pin die cuts, four envelopes, four card blanks and my card. The candy will stay open through Friday, January 4th and I will announce the winners on Saturday, January 5th. Well, it was a no go on the movie yesterday. By 9am it was snowing and it didn't let up until the evening. I'm still determined to travel to Middle Earth so Jac and I will try to make the trip today, weather permitting. 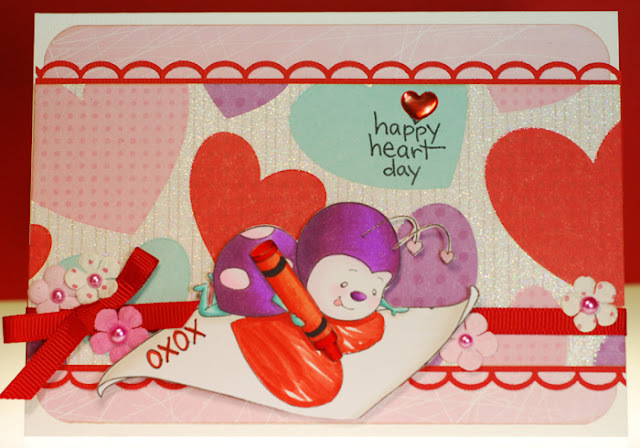 As for today's card, I was recently introduced to a new digital stamp shop called Alicia's Crafty Corner. As soon as I saw those big, beautiful eyes I knew that I wanted to use Photographer Alicia blown up and cropped in a 'big head' style. Printing her out this size also made it super fun to color her hair as well. And if this sweet face isn't enough incentive to check out these new digis then wait 'til you see the challenge that Alicia has going on right now. 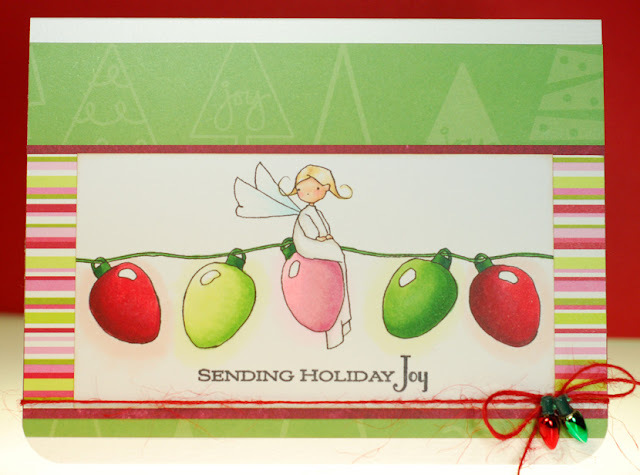 I'm entering this card into the open challenge which runs until January 7th and up for grabs is a Silhouette Portrait electronic cutting tool... talk about a WOW prize! I think that I was more tired than anything else yesterday so a bit of a sleep in did me good. No signs of that nasty cold taking me down any time soon. So far there aren't any signs of new snow falling today so I'm thinkin' I'll take advantage of my first Saturday off in months to finally go see The Hobbit. Alrighty time for me to go get my hobbit on, LOL! So I went and grabbed a paper pad that has also been waiting for me to get past Christmas cards and I got my girly pink fix taken care of. Mae seems to approve of the color choice as well as she is rockin' that lime green jacket. I had a busy day at work yesterday and once I got home I got sucked in to watching more Downton Abbey... love it! Luckily for me I already had this card made up for last week's review preview just waiting to be shared here on the ol' blog. I'm so excited that the Li'l Lolitas have found a new home at All That Scraps and it has been fun seeing the past digis finally become rubber stamps. Even more exciting is that soon we will be getting brand spankin' new, never before seen Lolitas and Lads! Okey dokey, time for me to scoot my boot and get ready for another day. Take care, stay warm and I'll see ya all manana! 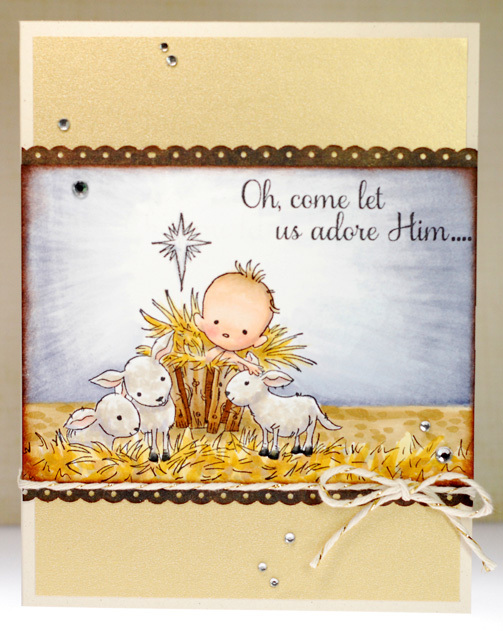 So today's card is for the Sweet November December release review preview over at ATS. I chose to use one of the Love Bugs from the Love Bug Fun set and did some altering by simply cutting him off the candy heart that he sits on. 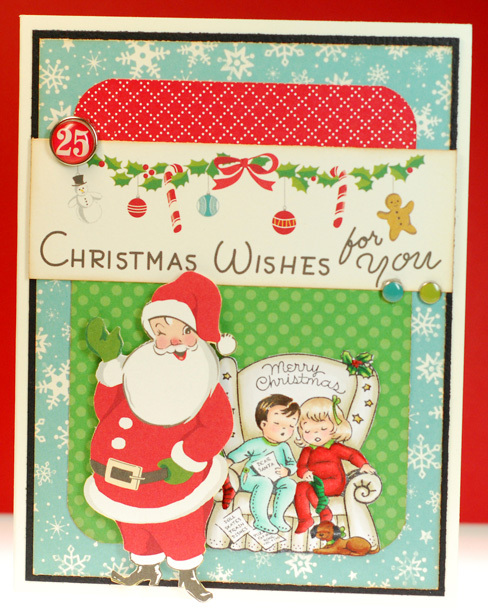 This was an easy way to change up the look of the stamp and play with a different design for him. 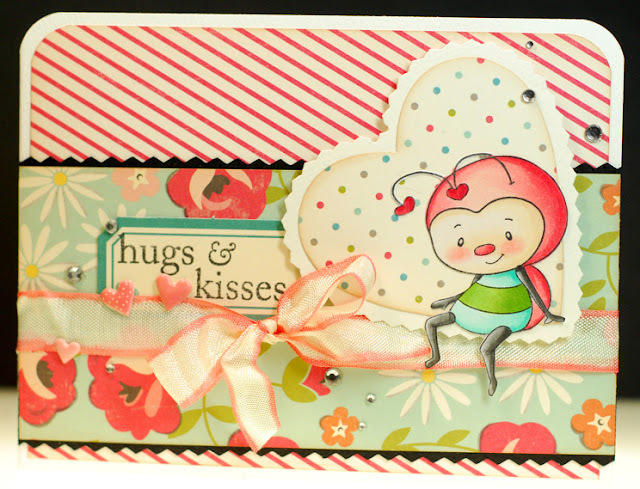 After all those Christmas cards these past couple months I couldn't resist pulling out some pretty spring looking papers to use with this li'l love bug... what a fun change of pace that was. It may not be traditional Valentine's colors but I think it works. Now be sure to skip on over to the ATS blog to see what my fellow teamies have made with the rest of the new December SN stamps. It's Christmas Eve day and the festivities have begun. 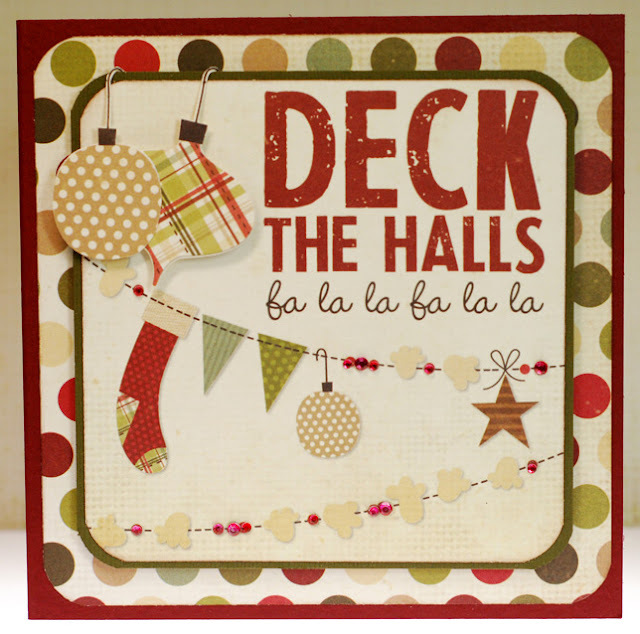 I'll be taking a break from posting tomorrow thus, I am going to wish you all good cheer and a very merry holiday! The count down to Christmas is on and I've got some goodie baking to do today with the help of my sister. There will be cut out cookies, popcorn balls and I still want to try my hand at that Christmas Crack. It should make for a pretty busy day. My card today was actually driven by the paper before the stamp, which is not my norm. I have really wanted to use that great subway art type print from October Afternoon but it proved difficult to pair up with anything because I would always lose too much of the overall look. I needed an image that I could easily cut out but nothing too big... say hello to You Shine a la mode. At first I didn't think she would work because that strand of lights would be a pain to cut but then I stamped her directly on the pattern paper first, then onto the Copic X-Press and colored her up there. Once I had that done I could just cut her and the bulbs out then glue them onto the initial impression. It's prefect... she's thin enough that you can still read most of those words in the background but bright enough to steal the spotlight. Ok, that's it for me today. Later gators! 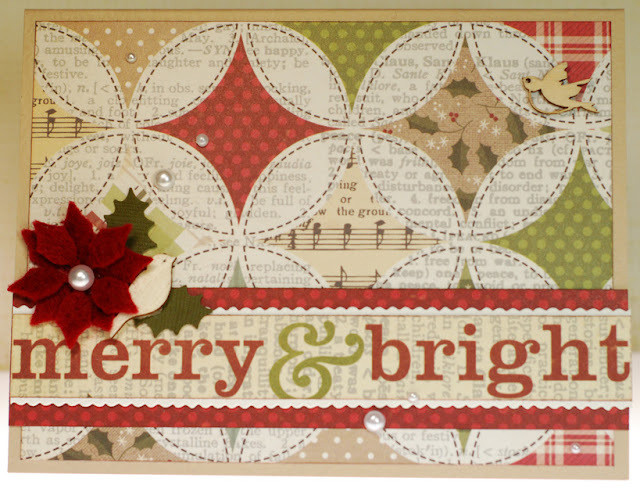 As I was making this card yesterday, and cleaning up my desk a bit as I'm trying to stay more on top of that, it dawned on me that I only have two more Christmas cards to make before the season ends this year... crazy! 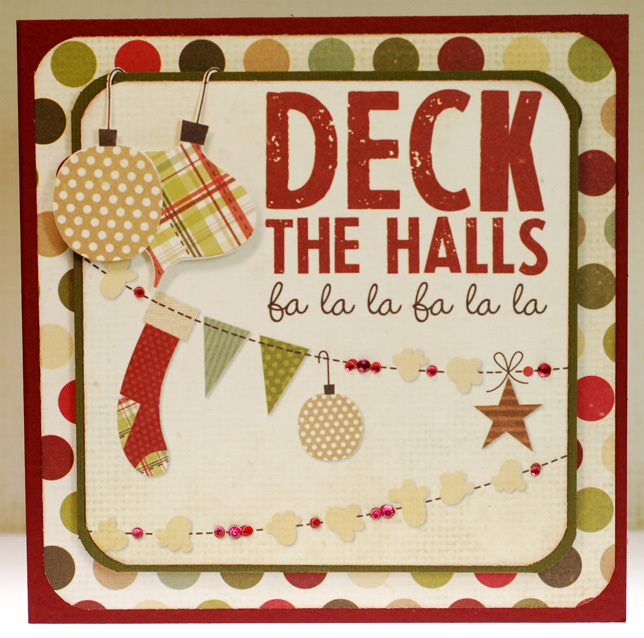 Two cards and it will be time for me to put away my Christmas embellies, papers and stamps until next year rolls around, I can hardly believe it. Now to figure out which two stamps will have a shot at getting on cards this year... the pressure! I hope that everyone is having a great last weekend before the big celebration. I'll be working today and it should be busy, busy, busy which helps the day speed along. 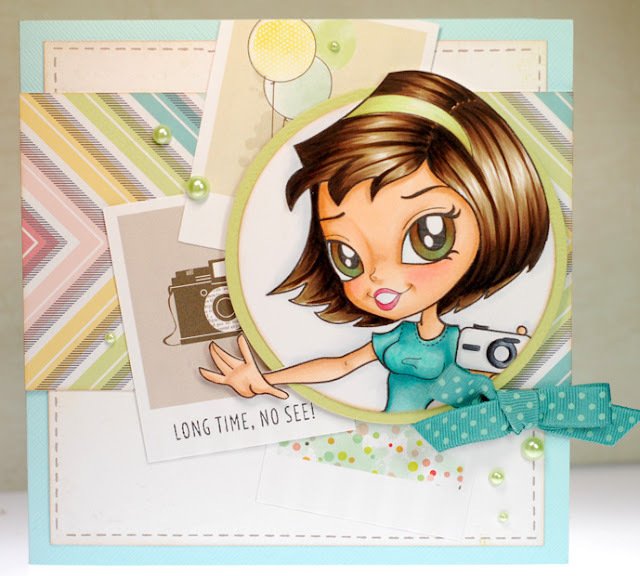 Today, I'm playing along with the Double Take Tuesday challenge over on the TGF blog and this week we need to use the color combo of red, green and teal. 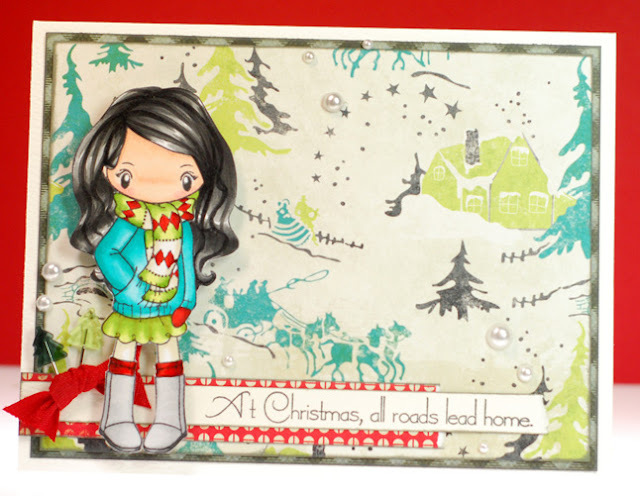 I had just the paper in mind because I have been dieing to use this fabulous retro type winter scene from Crate's Sleigh Ride collection ever since I got it and the colors are perfect. The teal and green were covered right away so all I had to do was add in a pop of red to make it all work. Then I used the last of the three Miss Anya Scarves girlies that I had stamped up to call this scene home. I'm so proud of myself for getting all three Anyas from the set onto cards before Christmas. Talk about a day... I ended up having to stay two hours late at work and then drive home in the snow storm that had been going steady all day. Luckily I had the 4 wheel drive to get me up all the hills since the snow plows must have been busy elsewhere. But I was totally beat once I finally made it home. Arighty friends, take care and I'll see ya in 24. 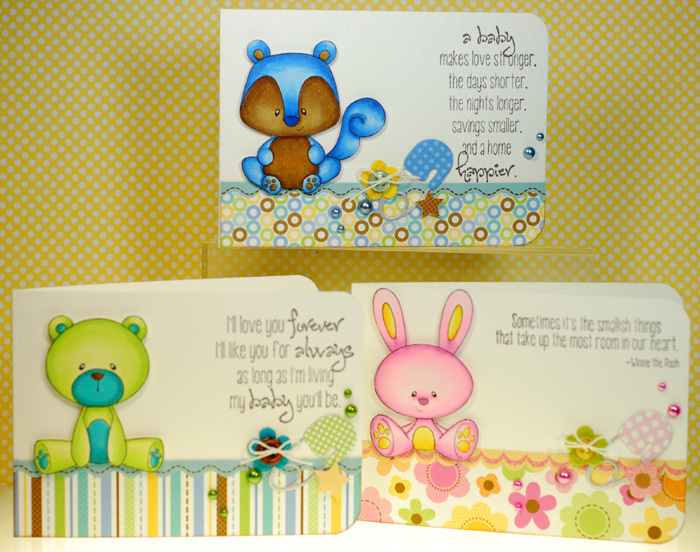 Okey dokey, there are loads of fab review preview cards to inspire over on the ATS blog today so be sure to check that out. And all of the new December stamps are available in the ATS store. I stayed very faithful to the original sketch because I liked how the layers of banners allowed for a bunch of different patterns to be added without really crowding the overall design. It doesn't show up great in the photo but the sentiment is stamped on a pretty, shimmery gold paper that helps tie all those prints together. And because I felt there was a lot going on in the papers I kept the embellishing to a minimum... just a single fancy brad was all it needed. Alrighty, I'm gonna scoot and see what kind of trouble I can get myself into today. No surprise that I've got another Christmas card to share today. I finally inked up this wonderful Nellie Snellen stamp called Hokey Pokey Dawn. I love these images but the intricacy can sometimes steer me away from them when I'm running short on coloring time. 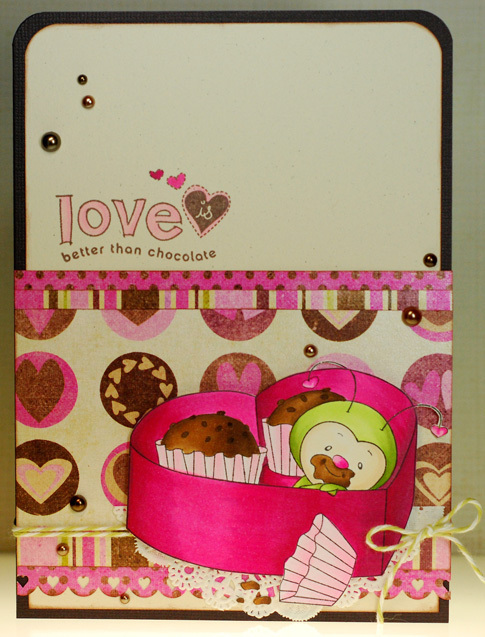 Luckily, I had plenty of time to finally enjoy getting this sweetie on a card. 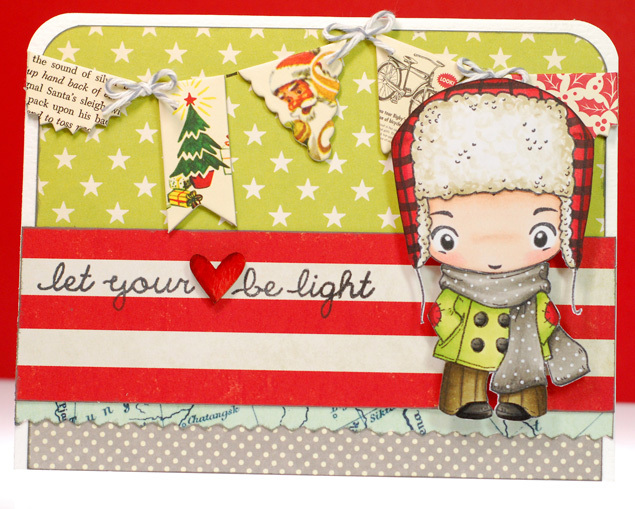 The papers I found to go with Dawn are just a random mix from my scrap bag that I think give this a kind of outdoorsy feel. Love using up more scraps... that's always a bonus. Ok, seeing as I'm gonna have to dig out the car if I'm going to get anywhere today I should wrap this one up. TTYL! It's official, we got snow, snow and more snow yesterday... it's a veritable winter wonderland out there. Driving home last night was quite an adventure so I'm happy that I've got no where in particular to be today. It might even be the perfect day to get in the kitchen and do some Christmas treat making. I found a recipe on Pinterest for a mix called Christmas Crack that I've been anxious to try so that is on the top of my to-do list. Ok, so I don't usually delve into world events here on the ol' blog because I try to keep it pretty crafty/stamping centric around here. But it is hard to separate the two today because the entire time that I was making this card yesterday I couldn't help but think of the recent tragedy in Newtown, Conn. My heart breaks for all of those who have lost their loved ones so senselessly. I found myself drawn to this Pure Innocence Angel and as I colored her those sweet babies in the news were constantly in my thoughts. I can't help but tear up even now as I type this... I just can't even imagine. 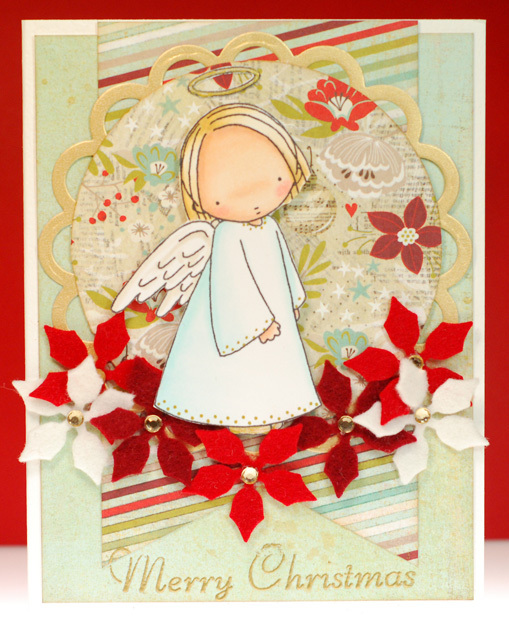 So even though this isn't really any different than any of the other cards I've made this season, for me, it has a bit of solemness to it and a hope for peace. Peace for those who lost their lives and peace for their families too. Sorry to bring down the tone of things today but I was compelled to share so I wasn't going to fight it. 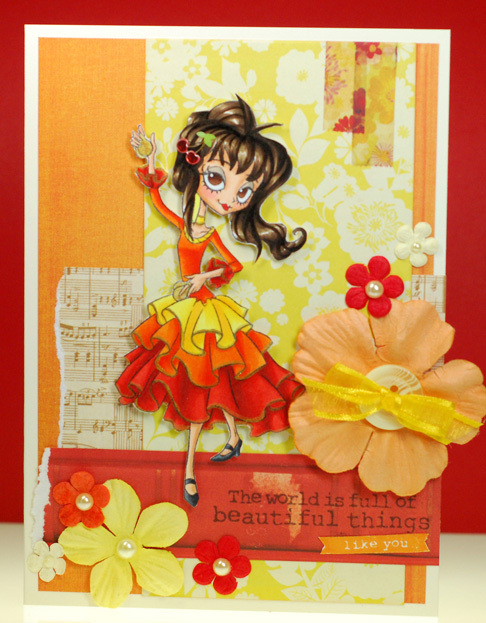 Welcome to the weekend fellow stampers! Like I mentioned the other day, I've been experimenting with a different shading technique on faces recently. It's funny because it's been a while since I've experienced one of those "Aha" moments in my coloring that has brought with it a shift in my style but this is one of them. That's why I love this hobby though, it definitely has the potential for constant growth and change which is exciting to me. And now I want to share how I go about it with all of you. It's nothing huge, just a subtle addition of shading across the middle of the face to allude to some facial definition on all of those nose-less characters that we all love to color up. I used Holiday Anya 2 for my example because she hasn't seen ink before this but I couldn't resist some altering as well. I made an easy change to her dress by snipping away the ribbon tails and I also replaced her long ponytail with a sassy little side bun that I borrowed from Princess Anya 3. 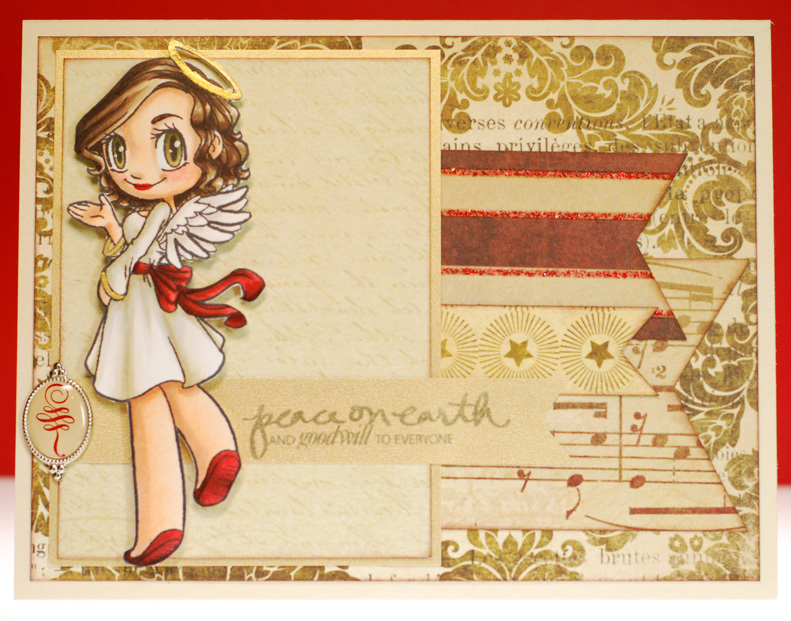 You can see the entire process on the videos here and here... or you can catch them over on the Color Me Copic blog. Anywho, I hope you enjoy! Now it's time for me to get myself ready for work. Have a good one! Ok, time to shower and get ready for the big shopping day. 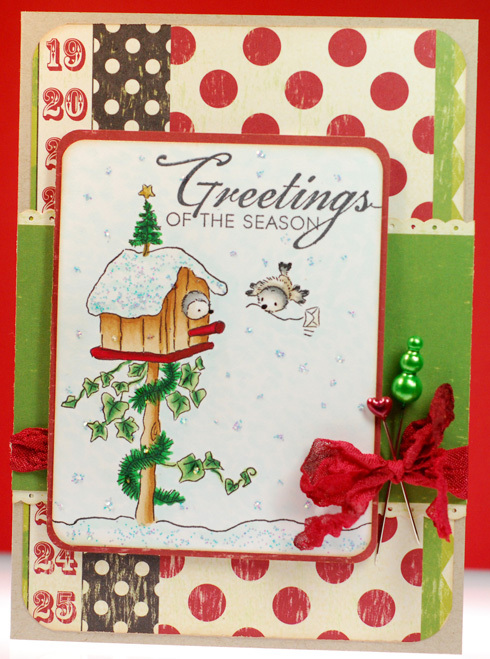 I'm playing in another TGF challenge, this one is the Farm Fresh Friday Christmas or Winter themed cards. Since the theme was pretty wide open I had a hard time settling on a stamp. In the end I couldn't resist Fuzzy Wuzzy Oliver's fantastic hat though I did swap WS Edward's sweet face in there. I don't use the chisel ends of my Copics much but I did put it to work creating that plaid pattern on his hat and I'm pretty happy with how that turned out. Ok folks, it's back to work I go. Don't forget to do something special at 12:12pm today... 12:12, December (12), 12th, 2012... pretty cool huh?! Needless to say, no creativity was happening. So I'm sharing another simple Christmas card that uses probably my most favorite Christmas papers released this year, Handmade Holiday by Simple Stories. Here's hoping that today is a bit more productive. So I am proud to report that I was pretty successful with my desk cleanup yesterday. It took longer than I expected but now I've finally got space to work again. There is still more to do in the rest of the room but that will have to wait for now. 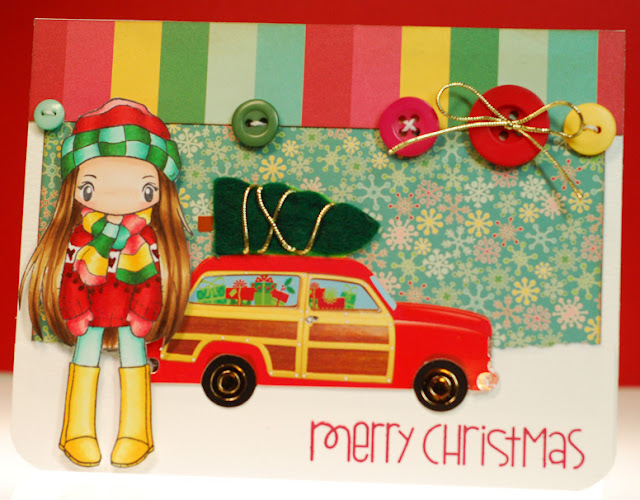 And since I didn't want to mess up all that hard work the card I made completely uses up stuff found in the mess. Well, it's Monday again and that means the Christmas rush is back on. Guess I should go get ready to tackle everything on the to-do list. Thanks for stopping by and I hope this new week is off to a great start for ya! Which of course gives me a fantastic excuse to just cuddle up and get cozy in my crafty room. It feels like I'm saying this every other post but my desk is a serious disaster zone so if I want to get anything done that will have to be tackled first. Wish me luck! Some LOVEly winners to announce! 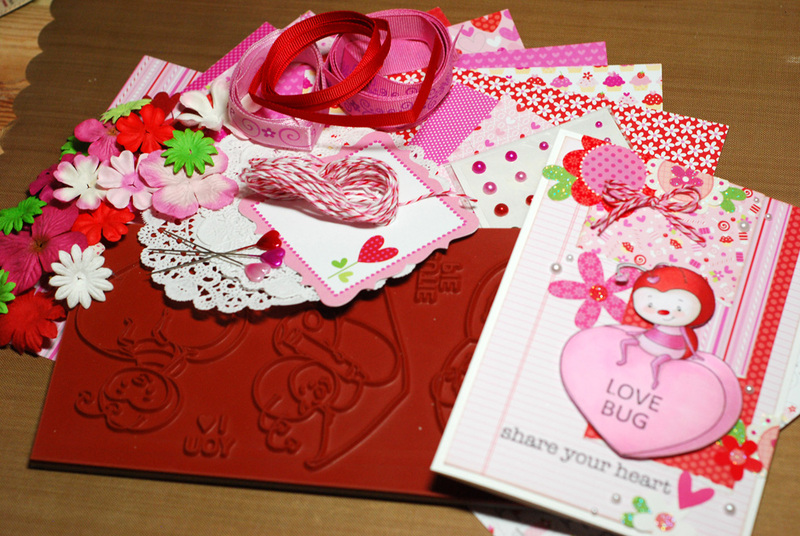 It's time to announce the winners of the Sweet November Valentine release! Big thanks again to everyone who came out for the December previews. It's your excitement that adds so much to sneak peek time! Well, I've got a full to-do list ahead of me today so I guess I should be wrapping this up. Sorry to post and run but I'll be back tomorrow with some candy winners! Even though we are smack dab in the midst of Christmas holiday festivities, this month's Sweet November stamp release is looking ahead to Valentine's Day. We've got cute new images to help make it a very happy heart day indeed! 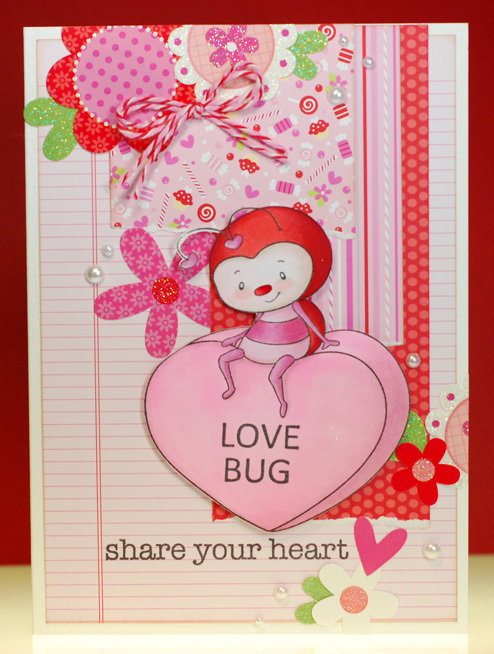 The Lovebugs candy kit includes; one Sweet November Lovebug Fun rubber stamp set, eleven 6x6 sheets of Doodlebug paper, Prima flowers and Kaiser Craft pearls, ribbon, twine, buttons, doilies, heart stick pins, four envelopes, four card blanks and my card. The candy will stay open through Friday, December 7th and I will announce the winners on Saturday, December 8th. Well, that wraps up our short and sweet Sweet November December release. 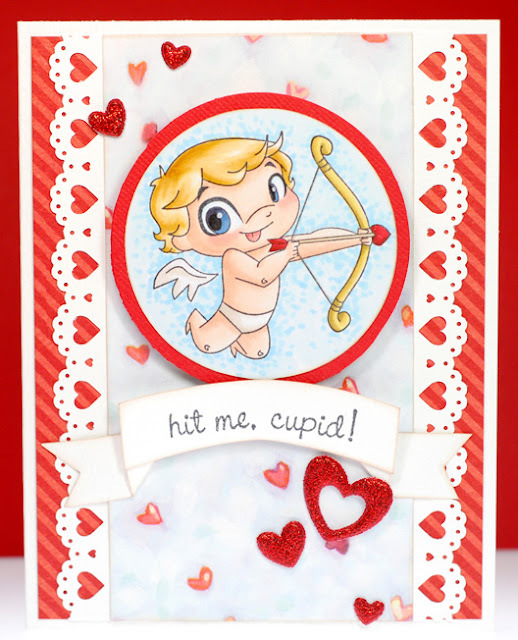 I really hope that you have enjoyed checking out these new Valentine's images. 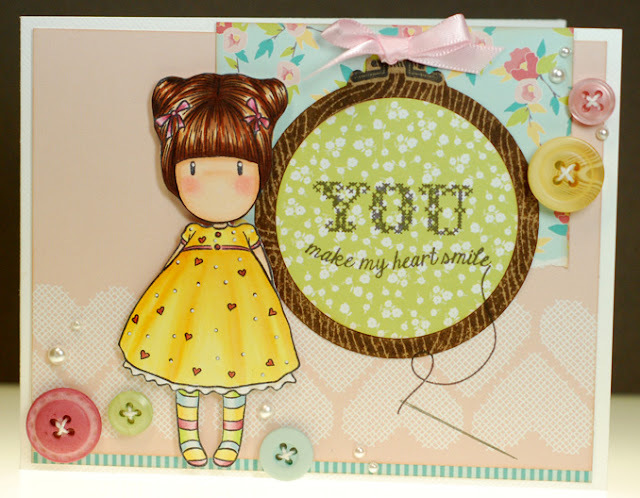 And don't forget to head on over to the ATS blog for all kinds of SN inspiration and even more chances to win!